Original Broadway and Touring Cast, 1973-74 (MGM/Decca) (3 / 5) Sort of a “revisal” of Gentlemen Prefer Blondes, though that word had not yet been coined when this show was staged, Lorelei had a new book and many new songs by Blondes composer Jule Styne, with lyrics by Betty Comden and Adolph Green. The star of both shows was the same, and so was the plot; a prologue and epilogue were added wherein central character Lorelei Lee reminisced about her life, to help justify the fact that Carol Channing was now too old for the role she had created 24 years earlier. The cast recorded the show before launching a year-long tour that was to precede the Broadway opening, but changes on the road led to a second recording. The first album, labeled “The Original Cast Recording” in big red letters and featuring a large drawing of Channing’s face, had three new Styne-Comden-Green songs: “Looking Back,” “Lorelei,” and “I Won’t Get Away.” There were also new lyrics for the original score’s “Sunshine,” retitled “Paris, Paris.” (Leo Robin wrote the lyrics for Gentlemen Prefer Blondes.) 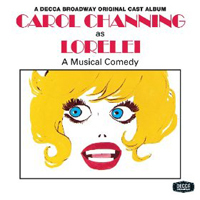 The second album was labeled “The Original Broadway Cast Album” in big blue lettering, with the same drawing of Channing. It added four tracks that were recorded a year after the first sessions: “It’s Delightful Down in Chile,” “Men,” a reprise of “Looking Back” leading into a reprise of “Diamonds Are a Girl’s Best Friend,” and a new overture. Inexplicably, some songs that were in the show when it reached New York were not on the album; but a new title song not performed on Broadway was included, probably to give leading man Peter Palmer more of a presence. The CD edition of Lorelei has everything that was recorded for both albums. Although the remastering is excellent, some of the tracks still sound hollow. Channing is in great voice and top form throughout. There’s not much opportunity for the other cast members to score on the recording, but Lee Roy Reams does a bang-up job with the jazzy “I Won’t Let You Get Away,” Tamara Long is a fine Dorothy, and Dody Goodman makes the most of her occasional comedic interjections. — J.D.